STORY: Ninja Master's focus is on the main character Sasuke, whom is on a quest to kill Lord Nobunaga and end his reign of terror and war. Choose your ninja... master's. lol. 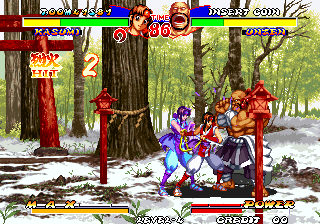 Pretty nice hand-drawn backgrounds... which you can see especially well thanks to the tiny characters. 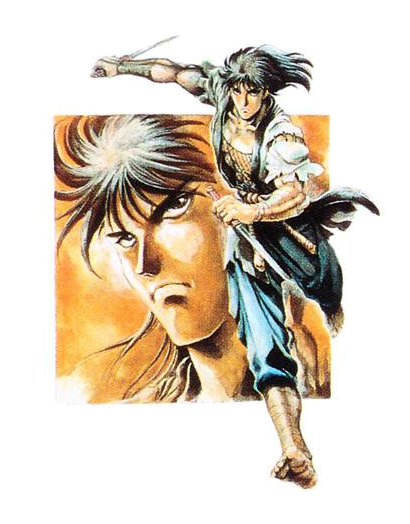 Some would say Ninja Master's is yet another "me too" 2D fighter in the mid 90's... but there might be enough unique content in Ninja Master's to warrant more attention than other "copy-paste" fighters attempting to ride the coattails of the successful games that came before them. 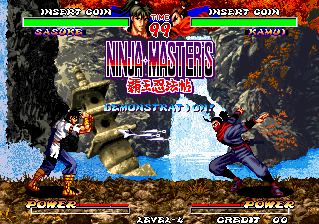 In fairness, Ninja Master's offers a pretty innovative gameplay element. 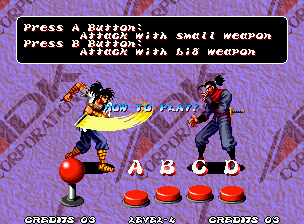 The characters in Ninja Master's have the option to fight bare handed, or draw their weapon. 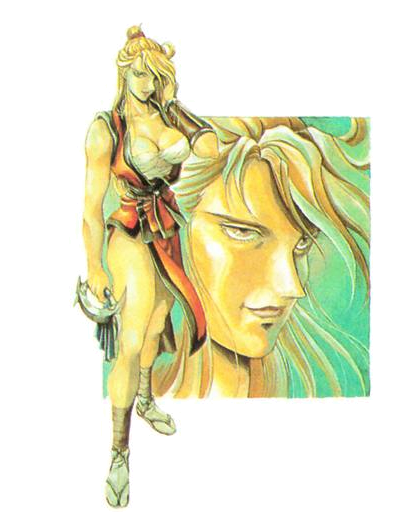 It's a cool idea on paper, and was one of the first games to implement this particular gameplay nuance. 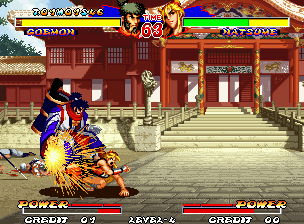 The gameplay system of Ninja Master's is pretty traditional for a 2D fighter, which doesn't have to be a bad thing. 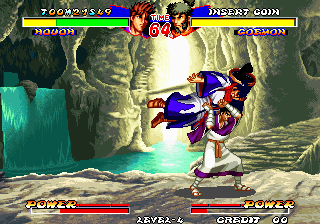 The animation / action onscreen isn't nearly as exciting as other fighters, but passable. 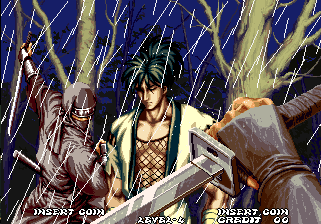 While Ninja Master's offers some semi-decent-looking environments, the characters are probably the game's weakest attribute. 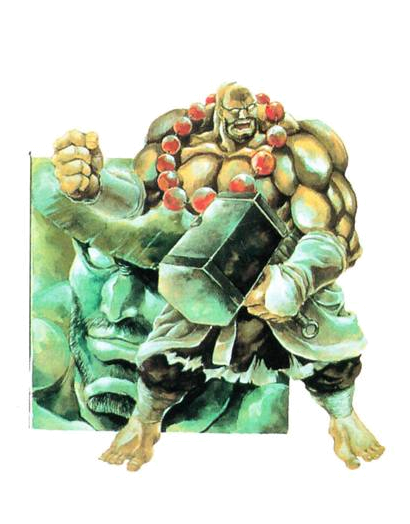 There a few cool character designs here and there, the overall roster lacks flash and excitement... there isn't much here that hasn't been done before (and done better). 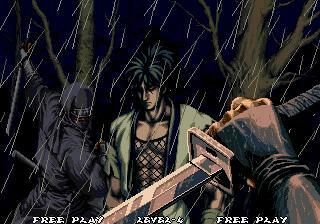 These ninja's seem to be sponsored by the ADK CORPORATION. How... fitting. 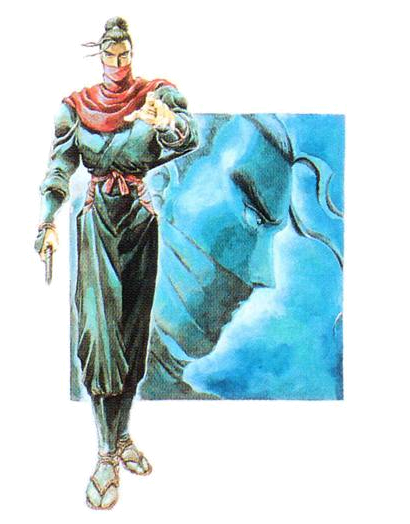 At a glance, some of the characters almost seem like generic "baddies" straight out of a 90's beat-em-up title. One could suggest that the dev-team was going for a "more realistic" twist on the weapon-based genre, but sadly, the movesets of the characters also come up pretty bland. 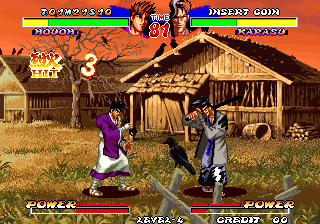 The characters sprites themselves are noticeably "skinny" and small on-screen... yet another negative contrast to the brighter and larger sprites of the top 2D fighters in 1996 (and years earlier). If this game was released 3 years earlier, it might've stood more of a chance. 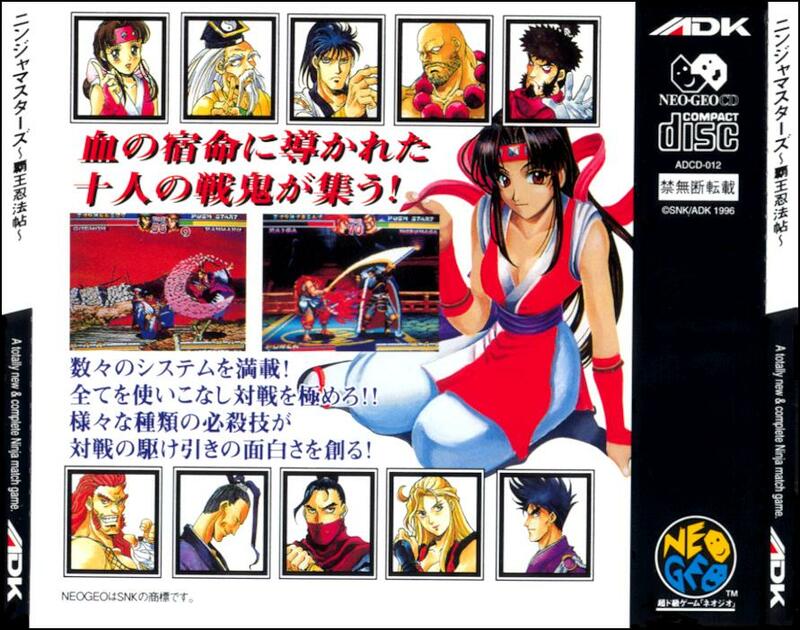 With brand new games like Samurai Shodown 4, Street Fighter Alpha 2 and X-Men VS Street Fighter 2 tearing up the arcade scene in 1996... let's just say it was difficult to be "drawn in" by Ninja Master's. 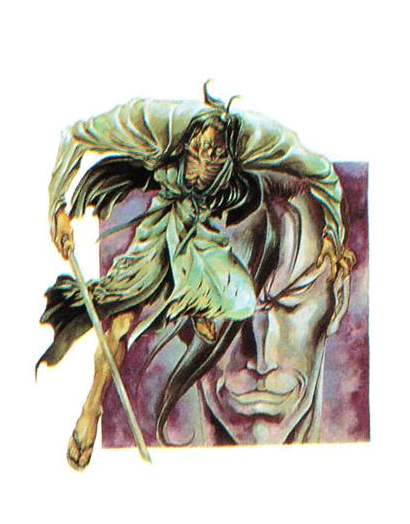 Also let's not forget 1996 was the year Soul Blade came out on PS1. 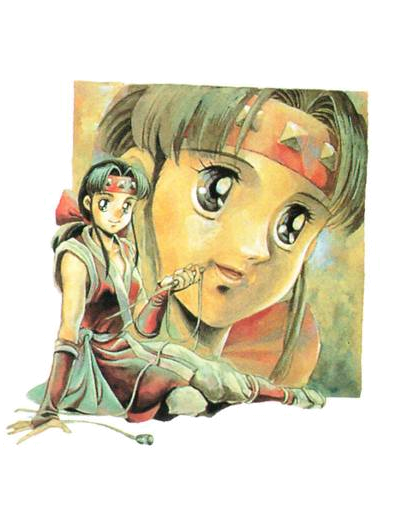 I suppose if you didn't acknowledge or play the games previously mentioned, perhaps you might've been more impressed by Ninja Master's than I was at the time. 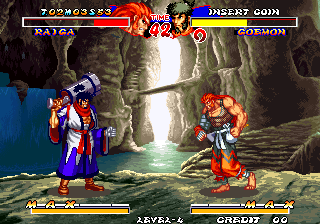 Ninja Master's isn't a completely terrible game from its most flattering angle, but it certainly doesn't hold a candle to any Samurai Shodown title... and there's four great games to pick from there, so pick one. 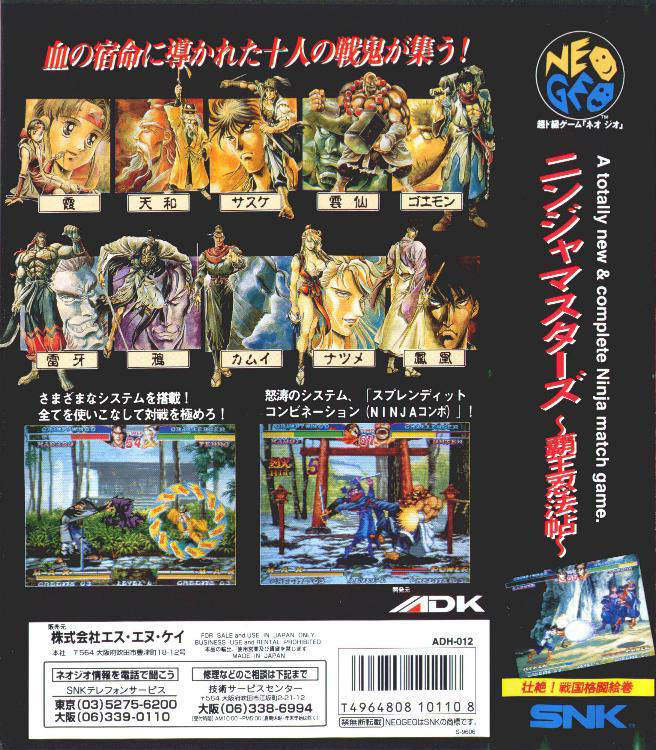 Furthermore, The Last Blade was released less than a year after Ninja Master's... again demonstrating the inferiority of this game. But 5.2 is pretty low, Frank... is the game that bad? No. It's just Weak. 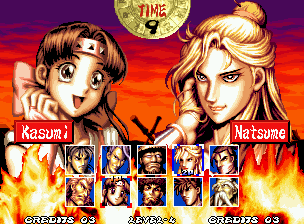 Honestly, after playing many other 1995-1996 fighting games, it's preeeeetty tough to be impressed by Ninja Master's... on any level. 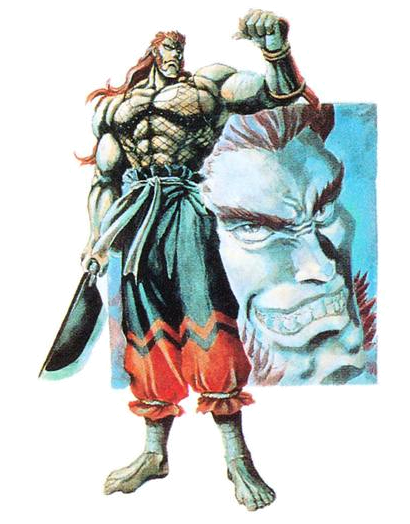 Ninja Master's was certainly lacking in more ways than one. 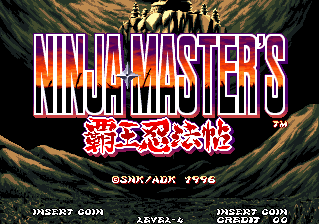 The basic theme of Ninja Master's is certainly cool... 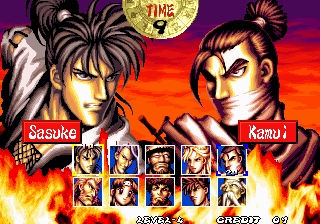 I've loved the idea of "Ninja VS Samurai" ever since I was a kid. 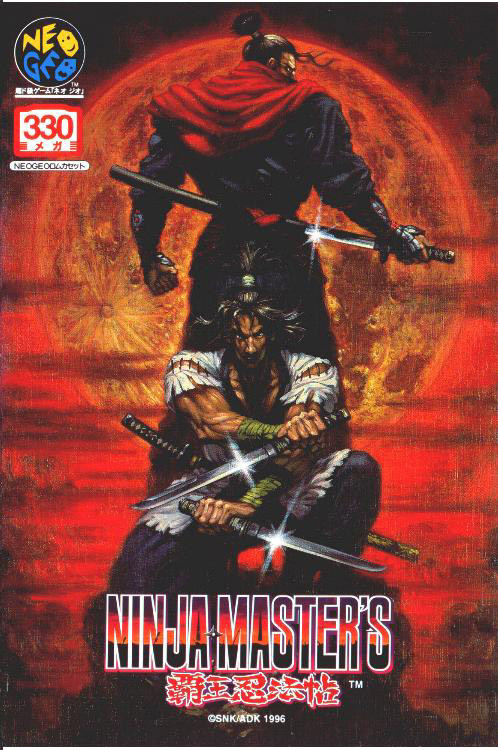 Speaking of which, I could've come up with a better title for a game than "Ninja Masters" when I was 6 years old. This game actually gave me flashbacks of seeing cheap knock-off ninja action figures when my mom used to take me to dollar stores. 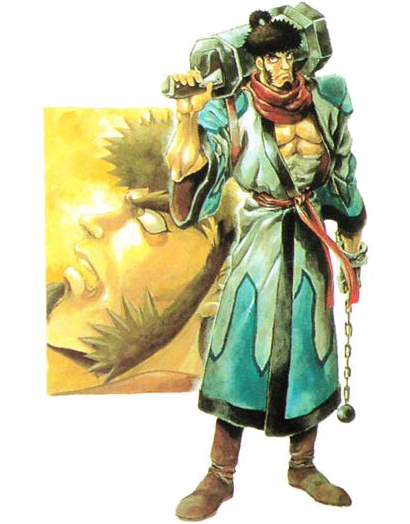 That's what some of the characters of Ninja Master's remind me of... dollar store knockoffs. Alright, I've had my fun... I'll stop picking on this game now.